Lamp is a vintage find from a friend. Jewelry box from Anthropologie. Necklace and Earrings are my own. Vintage sink and fixtures. Mirror from Anthropologie. Hand towel from Target. I am loving using the color turquoise as an accent in our house. 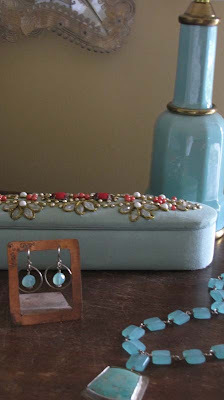 If you love turquoise, check out the blog - House of Turquoise. Someday I'll have a turquoise dining room like Anais Nin in the movie Henry and June. Charise, your pictures are so professional looking and your jewerely is spectacular. I'm so glad that you're doing this blog. I have enjoyed each and every post.